When you have a dog living with you, the choice of rugs can become complicated. It is not simply a matter of choosing what color and pattern you like. You also have to think about your dog’s safety and what will stand up to the wear and tear introduced by a four-legged friend. The best area rugs for dogs are made out of materials that can withstand a lot of muddy paws and the odd poop or pee accident. It helps if they do not show up the shed hair and are easy to clean. To help you choose, we’ve prepared a useful guide to the best area rugs for dogs that you can buy. A very versatile and hard-wearing dog rug that would suit any home. It is available as a rectangle, a runner or a round rug and in many different sizes. 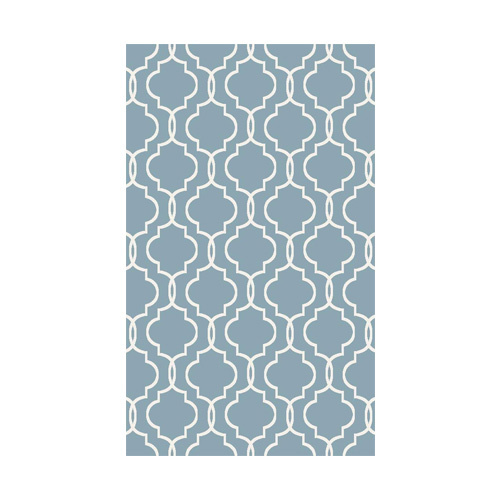 The 3-foot x 5-foot rectangular rug would look great in a small room. If you put the legs of a sofa or chairs onto the edge of the rug it makes the room look more spacious and avoids a cluttered look. It also makes it easier to lift the area rug if you need to. The versatile design of a repeated motif will complement any décor and is available in many colors including dark green, red or light brown. This is a half inch thick rug that will stand up to a lot of punishment. It is very hard-wearing and made of polypropylene so it will not stain and does not shed. It is also easy to clean. 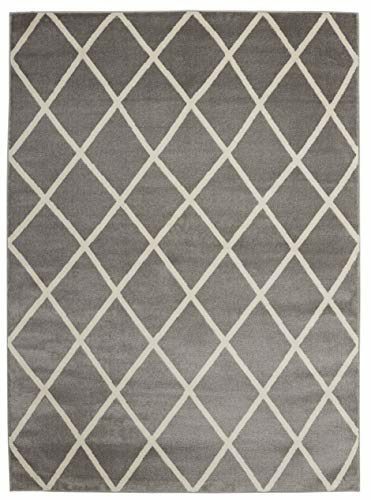 An area rug with a contemporary, diagonal design. It is available in four sizes and a range of colors including grey, ivory, and navy. Other designs are also available. The 5 foot 3 inches x 7 foot 3 inches size will adequately cover the center of a small living room. The rug is machine produced in Turkey to the highest standards and is an inch thick. The ‘power loom’ process produces a pile that is durable and long lasting. It is made from polypropylene so it will not shed. It is also stain, soil and flame-resistant yet it is soft to the touch. It can be spot cleaned with appropriate cleaning solutions and vacuumed. A medium sized, rectangular area rug at 5-foot x 8 foot that is half an inch thick and would suit a medium sized room. With this size of the rug, it is best to align the front of the sofa and chairs with the rug as it gives a feeling of space. If you place the front chair legs on the rug it makes it more stable. 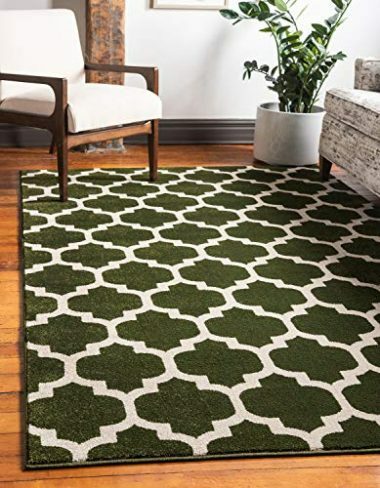 This rug is designed in the US and is also available as a round rug or a runner. It has an attractive, traditional Turkish rug design in pastel colors to suit any décor. It is manufactured in Turkey from polypropylene so it is easy-to-clean and stain resistant and it will not shed. The rug is a third of an inch thick and the cotton backing makes it softer and more durable. 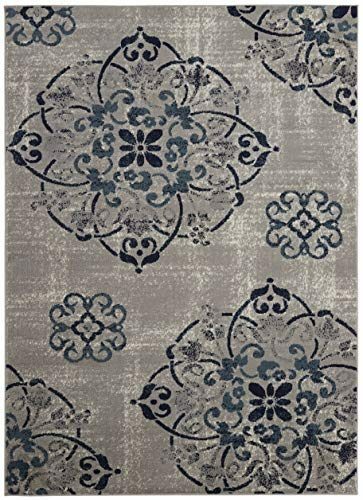 A lovely rug with a floral medallion design in gray, navy, teal and ivory that would suit a living room, or dining room and even a bedroom. It covers a rectangular area of 6 foot 7 inches x 9 foot 3 inches and so would suit a medium to large room. There are smaller and larger sizes available. 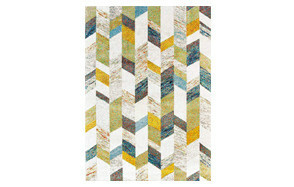 The rug is machine-made in Turkey from polypropylene fibers and has a jute backing to give it strength and durability. It is a third of an inch thick and vacuuming is the best way to keep it clean although it can be spot cleaned with an appropriate cleaning solution. It resists stain, soil and is flame resistant and it will not shed thanks to the power-loomed design. The rug is soft to the touch. This luxurious rug has a two-inch pile that will make your dog feel snug and comfortable when they lie on it. The attractive geometric design will hide any marks caused by paws or shed coat although several other designs are available. It covers a rectangular area of 5-foot x 7 foot and will suit a small to medium room and a larger version is also available. It is manufactured in Turkey using a power-loomed process from antistatic polypropylene fiber. It offers both longevity and durability and will not shed. It is suitable for areas that are frequently walked over. A compact rug that will cover an area of 3 foot 3 inches x 5 foot and would suit a small living room. It has an attractive light-blue repeat pattern design but alternative patterns and sizes are available. It is made from 100 % premium polypropylene which is a durable and hardwearing manmade fiber. The jute backing ensures that it stays in place and is also very hardwearing. It is manufactured in Turkey using the power loom method. The rug is soft to the touch thanks to the low-pile fibers but is very resistant to damage. It is very easy to clean and is anti-bacterial as well as being very resistant to stains. 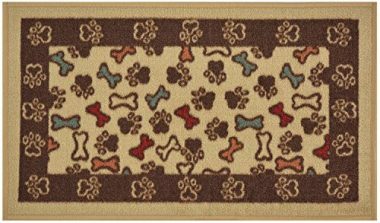 This is a very compact dog rug (mat) that measures just 17 inches x 30 inches and would be suitable for doorways, hallways, and corridors. 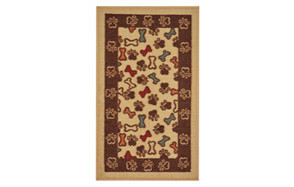 It has an attractive doggy design with bones and pawprints on a beige and brown background. It is made from nylon pile with a height of just a quarter of an inch with a slip-resistant rubber backing for safety. The pile is colorfast and the rug is mold-resistant as well as stain-resistant. It can be spot-cleaned but cannot be put in the washing machine. 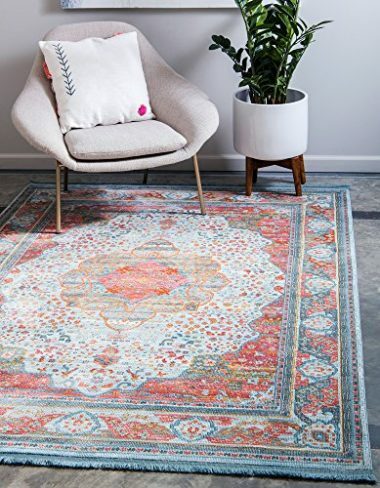 A small area rug (3 foot 11 inches x 5 foot 3 inches) that would be an attractive addition to any room with its lovely Persian design and modern ‘distressed’ appearance. It is also available in other designs and sizes and makes a great pet carpet. It is made in Turkey from the highest quality polypropylene so it is soft and durable. It is suitable for homes with pets thanks to its durability and you can spot clean it. Regular cleaning with a vacuum will keep it looking at its best. Of course, the main consideration when buying a rug for your home is the design and color and this is a matter of personal taste. Bear in mind that your dog is likely to track mud and dirt from outside onto the rug. They also like to chew and tug at rugs. Shed fur can show up on rugs and look unsightly but flea eggs can actually live inside it. There is always the possibility of pee, poop or vomit being deposited on the rug and causing a stain as well as a lingering odor. So, if you are buying an area rug for a room where your dog will be spending a lot of time, there are some other things that you should look for. This is a key consideration. It needs to be durable and easy to clean. Manmade fibers like polypropylene and nylon are ideal. They trap dirt and shed hair near the surface so that it is easy to vacuum away. Wool will also do this but it is expensive and will cost a lot of money to replace if it gets stained. Stain-resistant. In reality, there is no such thing as a 100% stain-proof rug when you have a dog in the house. Nevertheless, some rugs are more resistant than others. Polypropylene is a material that is known for its stain-resisting properties. You should be able to spot-clean the rug and it will look as good as new. Odor resistant. Odors can be harder to get rid of than stains. Some material clings on to them, even after you have washed off the substance that caused the smell. Heat-treated polypropylene is excellent at resisting odors. In general, darker colors are better because they will not show up dirt from mucky paws as much as light colors. On the other hand, if you have a heavy-shedding dog with a pale coat, this will show up on a black rug! You may be better choosing a rug that matches your dog’s coat. Pattern choice is not just about what you personally find attractive. The pattern of a rug is important when it comes to shedding fur and stains. Plain rugs of a single color will show up every hair that your dog sheds! Whereas, a complex pattern will help to hide it. When it comes to hiding stains, a tight pattern is the best option for pet-friendly area rugs. There will be no open areas where stains can show up and they will just get lost in the complexity of the pattern. Size of a pile. The best rugs for dogs have a short pile. They are easier to clean and will not trap shed hairs. Also, your dog will not get their claws stuck in it which can cause damage to themselves and the rug. For this reason, a cut pile is preferable to a looped pile. Some dogs actually like to dig in long piled rugs which is not desirable at all! Tassels and fringes. These should be avoided completely. There will be a temptation for your dog to chew and pull at them. They can present a serious choking hazard if they come loose. Backing material. A tufted rug with a glued-on back is not the best carpet for pets. Urine or other body fluids can soak through them into the glue and create a permanent odor. Latex backing material will break down if it is repeatedly soaked with urine and will stick to the floor surface beneath. If this is a hardwood floor, it can cause hundreds of dollars’ worth of damage. Size. At the end of the day, it is possible that something will happen to your rug. It may be best to buy two smaller rugs rather than one bigger one so that replacements are not so expensive. There are some materials that are very unlikely to withstand the rigors of life with your four-legged friend. Here are some examples. Viscose. This is a lovely material that feels like silk and has a sheen. It is in no way dog-proof. It will stain very easily and the mark will be almost impossible to remove. This is not good news if you have a dog running in and out of a muddy yard or who is prone to poop accidents in the house. Seagrass. A very attractive natural material that is great at catching dirt and sand. The disadvantage is that dogs tend to be attracted to the natural fibers and like to poop and pee on them! 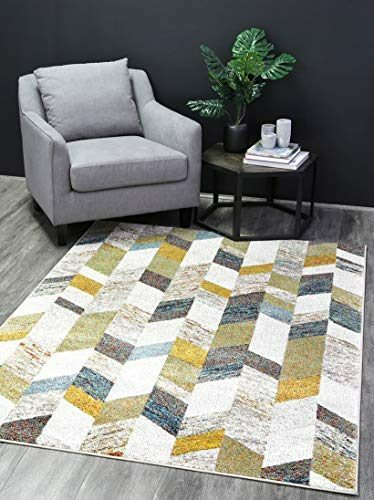 Even if you can get rid of the visible stain, the fibers will not release the smell and it will hang around in your home until you get rid of the rug. The fibers can expand and contract when they get wet so a lot of spot cleaning will wear them out. Hook and loop materials. These are very soft and luxurious but are not great for homes with dogs. Their claws can get caught in them and when they pull, the continual loop design means that you could lose a whole section of the rug! Rayon, silk, and chenille. These are luxurious and delicate materials and so are best avoided in rooms where dogs spend a lot of time. 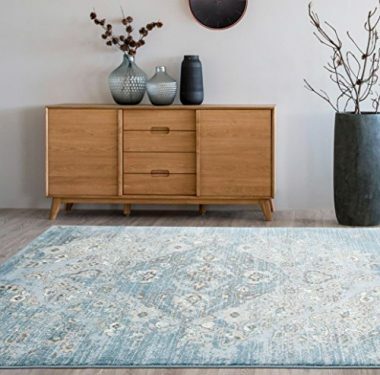 You would be forgiven for thinking that buying a suitable rug for your home is just too complicated and that you won’t bother but that would be a mistake. There are several advantages to using pet-friendly rugs. They look great. You don’t have to sacrifice style to get a hard-wearing and dog-resistant rug. You can have both. Rugs are available in a huge range of patterns and designs to suit any home and will give your décor that finishing touch. They protect hardwood floors. Hardwood floors and dogs do not always mix. Your dog may not appreciate skidding around on the floor and they may scratch it with their claws or with toys. A large rug affords a lot of protection. They protect carpets. If you do have fitted carpets, you will know how much they cost to replace and how much it costs to get them professionally cleaned. Dogs can cause a lot of damage to carpets by soiling them with their paws, shedding on them and with the ‘little accidents’ that can sometimes happen. A rug provides a barrier between the dog and the carpet and extends the life of your carpet. Dogs like them. 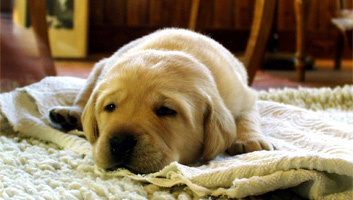 Dogs love to curl up with their family and a rug gives them somewhere comfortable to do that. Safety. Shed fur, water spills and moisture from wet paws can make hardwood surfaces very slippery. A rug helps to absorb that moisture and to trap shed fur where it can be removed safely. 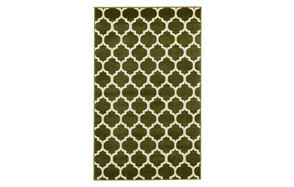 Very small rugs can be used for this purpose in doorways and hallways. Q: Will steam cleaning or water cleaning damage my rug? A: This depends on what material the rug is made from. Always consult the manufacturer’s instructions on how to best clean the rug. Many manmade fibers such as some polypropylenes are durable enough to withstand steam cleaning. Most materials in dog proof rugs will withstand cleaning with water but again, it is best to check. Spot cleaning with water and an appropriate cleaning solution is a useful way of dealing with small areas of dirt and poop and pee accidents. Q: How often should I clean a rug for dogs? A: A daily vacuum will be needed to collect up all the loose shed hair and dust. It also keeps your rug looking at its best. Cleaning the rug can be carried out as it needs it. Some owners like to clean dog-friendly rugs three or four times a year. In between, you obviously have to spot clean any poop or pee accidents. Q: Do I need protectant on my rugs? A: It is not necessary for the stain-resistant rugs but could be a good idea for other materials. Often it has to be reapplied after a few months. Some sprays are formulated to deter dogs from biting rugs, they are more like a repellent spray. It will protect your rug from being chewed and bitten by your dog when you are out. Our top pick is a hard-wearing rug that is rectangular and would look great in a smaller living room – Unique Loom Trellis Collection. It has a repeated motif pattern that would complement any décor and will not easily show up marks of shed fur. It is available in several colors. It has a short pile (half an inch) so it will not get caught in claws and is easy to vacuum. The polypropylene fibers are stain-resistant and odor-resistant and are easy to clean.